More than two out of every three adults in America is overweight or obese, according to the National Health and Nutrition Examination Survey. For some people, this is due to something other than dietary intake, such as hormonal disorders. For everyone else, it's the result of taking in too many calories from food and not leading an active enough lifestyle. Not only does excess calorie intake pack on the pounds, but eating too many calories from certain sources causes other health problems. Together, these can cause an avalanche of issues that negatively impact your overall health and well-being. The good news is that taking charge and making the necessary changes effectively reverse these effects or prevent them from progressing in most cases. Weight gain is a major effect of eating too many calories. Your body needs enough calories to function, but when you take in more than your body uses, it stores the excess calories in the form of fat. Extra calories are mainly stored in the form of triglycerides, which, when elevated, places your heart health at risk. As with other lipids, too many triglycerides accumulate in your arteries, increasing the risk of your arteries becoming hard, stiff and narrow -- a condition known as atherosclerosis. Stiffening of the artery wall increases the risk of having a heart attack or stroke. Once you're overweight, the risk for fatty liver disease, certain cancers and high blood pressure increases. It also increases the pressure on your joints, raising the risk of osteoarthritis. The extra fat surrounding your neck can cause breathing problems and lead to sleep apnea, a condition in which you stop breathing temporarily while asleep. The type of extra calories plays a role in the effects on health. 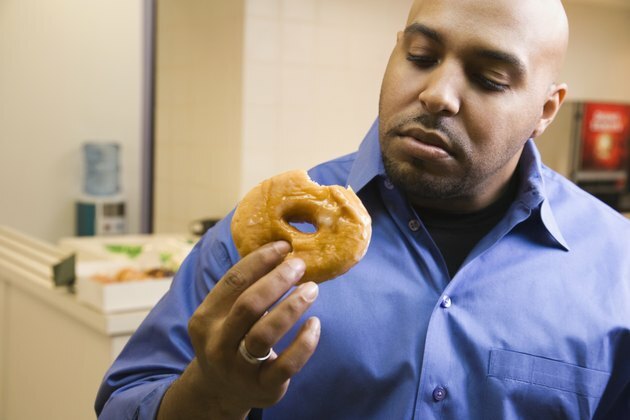 Getting too many calories from refined, processed carbohydrates is common in the U.S. and has its own risk factors. Added sugar is a major source of excess calories as a form of refined carbs in the American diet. The effect of added sugar intake on insulin sensitivity is still debated. However, taking in too many calories from refined carbohydrates is thought to increase the risk of insulin resistance. Reducing added sugar intake significantly improves insulin resistance, according to a study of Latin adolescents in Los Angeles. The study involved 16-year-old overweight females at risk of type 2 diabetes. Under instruction, the teens reduced added sugar intake and increased the amount of whole grains they ate. This dietary modification led to better glucose control and lowered their risk of type 2 diabetes, according to the results. The study was published in the Metabolic Syndrome and Related Disorders journal in June 2007. Excess sugar also promotes inflammation, a key factor in atherosclerosis. High sugar intake increases the risk of coronary artery disease, according to an American Heart Association statement published in the journal Circulation in 2002. Eating too many calories in the form of trans fat and saturated fat raises the level of total cholesterol in your blood and, in particular, low-density lipoprotein, or LDL -- the harmful form of cholesterol, more so than other dietary components. This matters because elevated levels of LDL are linked to a significantly increased risk of coronary artery disease -- the leading cause of death in the United States. CAD occurs when the main artery that supplies blood to your heart becomes hard and narrow from a buildup of cholesterol. Because of their structural characteristics, LDL promotes atherosclerosis more than other types of fat. Make a conscious effort to reduce the amount of calories you take in if you know you're eating too many. Simple changes can have a big impact on your health risks. Completely avoid trans fats, and replace some saturated fats with unsaturated fats. Good sources of unsaturated fats include oily fish, nuts and seeds and plant-based oils like olive and sesame. Replace added sugars with sweet whole foods such as fruit. The amount of sugar in fruit is naturally low, and because fruit contains fiber, it reduces the rate at which sugar enters your bloodstream, making it a much healthier choice of sweet food. If you're like most Americans, you're not getting enough servings of fruit each day. Take fruit with you on the go as a snack, and keep fruit available in bowls at home. Since added sugar is a major source of added calories in the typical diet, it's a good place to start. Cutting back has the beneficial result of lowering your overall calorie intake. Focus on making healthier food choices, and you'll reap the health benefits.